Automation Workshop is being constantly developed and improved. Users are automatically notified on the availability of new version by a message in application. 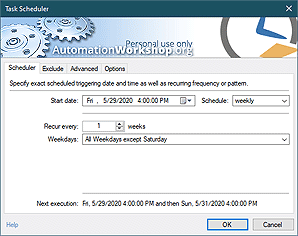 Updating Automation Workshop Free Edition is very easy. When the application notifies you about the update, click the Check for update option in the Help menu. It will lead you directly to download page where you can download the newest version of the software. Software versions are backwards compatible and newer Automation Workshops can run Tasks created on older version. During the installation process, however, it might be a good idea to backup all Tasks, stop service and close manager. There is no need to uninstall the existing version. Full update instructions · how to install updates. Release notes · see what is updated in new version. We highly value your opinion and welcome to contact us with your comments, suggestions and questions.